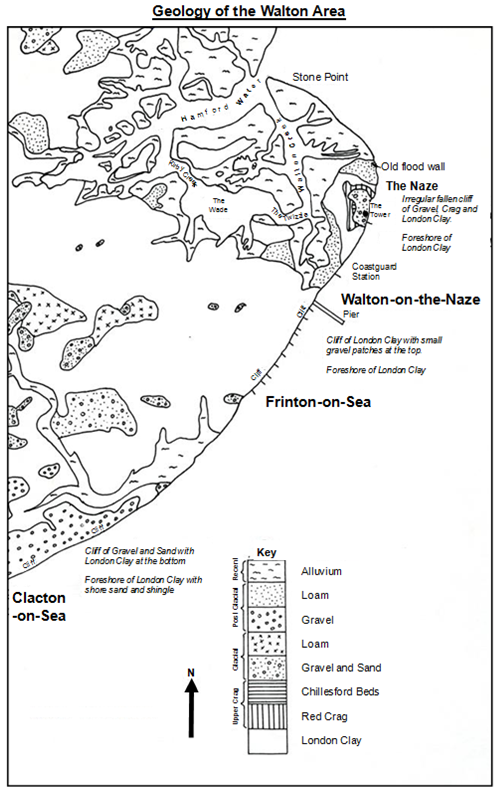 The cliffs all the way along the coast at Walton-on-the-Naze rest on London Clay. On top of this are a number of other deposits. By the Naze Tower the cliffs are level and rise about 20 metres above the beach. Further north, the cliffs decrease in height, over a distance of 300 metres, to just 4 metres above the level of the beach. Over the next 220 metres they gradually decrease to the flood wall. This is a layer of clayey loam. it is thicker at the northern end where it lies directly on top of the London Clay. These are made up of gravels, clayey sands and thin, grey clays. these beds are missing alonmg the lower cliffs to the north. This is a red-brown, sandy, shelly layer. This bed is rich in fossils and was deposited when the area was covered in warm seas. these deposits are the only ones of this age known in Britain. the combination of shells found in this bed is unique. One fossil is 'Neptunia Contrarius', a whelk which is unusual because its shell spirals 'anti-clockwise' and opens on the left, whilst most modern ones spiral the other way round. This is a sticky, grey, impermeable clay which was formed around 60 million years ago. the top layer is very contorted. the rock contains many fossilised shark teeth and plants. Copyright © George the Geographer 2014.